AIBD in collaboration with its global partners presents the World Television Awards 2019. “The Winner Prize” consists of US$ 5,000.00 cash, a trophy and a certificate presented by AIBD per Award category. 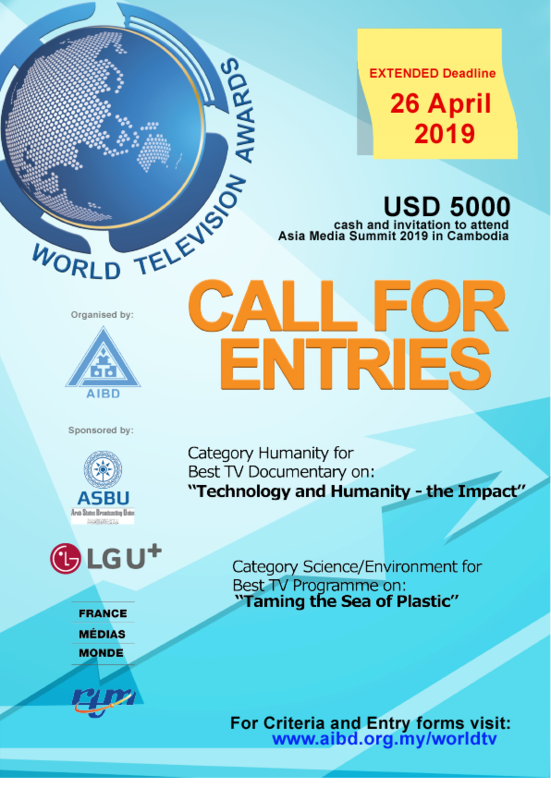 Category Humanity for the Best TV Documentary on "Technology and Humanity - The Impact"
Category Science/Environment for the Best TV Programme on "Taming the Sea of Plastic"
Winners will be presented with their Awards during the Asia Media Summit to be held in Seam Reap, Cambodia from 11 to 14 June 2019, a global gathering of broadcasters. The "extended" deadline for programme submission is 26th April 2019. The World TV Awards 2019 are supported by Arab States Broadcasting Union (ASBU), France Médias Monde, Radio Television Malaysia (RTM) and Asia-Pacific Institute for Broadcasting Development (AIBD).